This is the standard composition mount. It is shown with uni-rac solar mount and an L foot. It works with any rack that utilizes an L foot, as well as pro-solar and uni-strut. The flashing is 12" x 12". 5" x 12" is exposed, and 7" x 12" is under the next rows of shingles. Quick Mount PV is a waterproof anchor for attaching solar panels to a roof. It is a quality foundation for any roof mounted system that cleanly handles the waterproofing and flashing while minimizing the labor and damage to existing roofing systems. It is ideal for existing composition shingles and shakes. 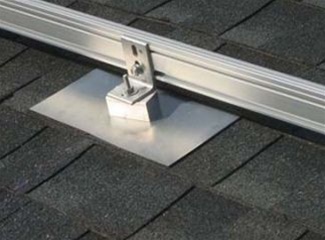 The Quick Mount PV is designed for cost-effective rail mounting on composition shingle roofs. It provides a unique combination of a solid rail mounting base and a code-compliant, NRCA-approved flashing system that installs easily and quickly. Approximately 70-75% of the roofs in North America are covered with composite shingles – usually colloquialized to "comp shingles". Typically, when installing PV arrays on these roofs, an L or T foot is located over a rafter and holes for the lag bolts are drilled directly through the comp shingles. The International Building Code (IBC) now lists a number of requirements for flashing roof penetrations. Further, the National Roofing Council of America insists that all penetrations must be flashed and lists a number of "best practices" for flashing penetrations. Failure to flash properly will often result in voiding the roof and/or roofer's warranty. Quick Mount PV flashings specifically address these issues. The Quick Mount PV flashing system adheres to all IBC and UBC/CBC code requirements for flashing roof penetrations. The Quick Mount PV flashing system meets or exceeds the minimum standards of the National Roofing Contractors Association (NRCA), the American Roofing Manufacturers Association (ARMA) and the National Fire Protection Association (NFPA). The Quick Mount PV flashing installs quickly and easily saving time and money on both materials and labor. Quick Mount PV is constructed of heavy aluminum and has an expected life of 50 years.